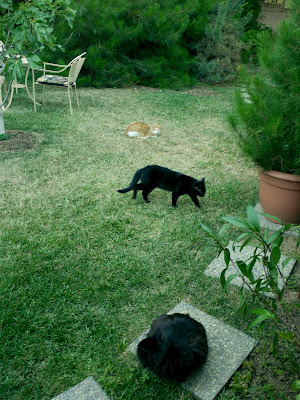 A Tail of 3 Kittehs: Drama & Fireworks! He's a young boycat that just started sniffing around. Moms calls him "Hawkfood" since he's so small. ...we growl and sniff and snort and we kick him OUT. Black Kitteh has been very verbal about not wanting Hawkfood around! like she did to me! I think I'll call her Jezebel! Or maybe I'm just an "Independent Kitteh!" Sandy says "Happy 4th of July!!" Oooohhhh, yes because I'm shooting blanks and sleek, new Hawkfood still probably has his (ahem) jewels. Oh that would be so cute, but so bad too. 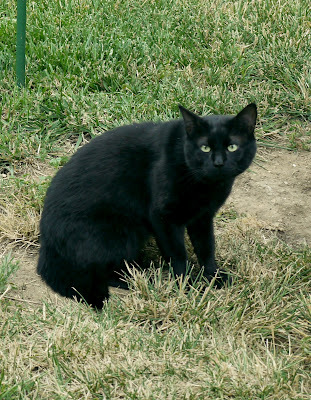 People still think black kittehs are bad luck, EVEN NOW (silly, silly people, black kittehs have brought me GOOD luck)! Well now we know Black Kitteh can't get pregnant!